Not too long ago I was looking through pictures and noticed that there were several times in my life where my weight fluctuated. I would go from being in decent shape to being pretty overweight in no time at all. When I was a freshman in high school I weighed 188 pounds is still considered overweight for my height, but at that time because of sports and being incredibly active it was more muscle than fat. I committed to not drinking any soda whatsoever and went several years without drinking even a single drop. As the years went by I made choices that would later come back to haunt me. I slowly introduced myself back into drinking soda...at first diet...and that eventually led to full fledged Pepsi. I would drink a Pepsi whenever I had access to one and usually that was eating out. Eating out to me was an opportunity to stuff my stomach full of meals that were insanely bad for me. By the time I graduated high school I was up to 220 pounds....an insane weight-gain in just a few years. Throughout high school I had tried to lose the weight, but was never committed. Pepsi always tasted better than water and cheese fries always tasted better than a salad. Time after time I would try to diet, but would fail. I prepared to go off to college and wanted to lose the weight and remember telling myself how I would be in the fitness center all of the time and that I would lose the weight in college. I must have forgot how good the bacon, waffles, biscuits and gravy and chocolate milk were in the dining hall. Each morning I would make my way to the buffet style dining hall and stuff myself 2 or 3 times a day. I'd fill myself full of calorie packed food and then wash it down with a sugary and calorie filled glass....okay...glasses...of soda. It wasn't until after I had been married to my wife for about 6 months that I had had enough. I stepped on the scale and it read 250 pounds. Just seeing the numbers pop up on the digital scale made me want to vomit. I felt depressed and defeated. I walked into work one day and heard some co-workers talking about organizing a "Biggest Loser" competition that would start January 1st, 2008. I was a few months away from graduation and thought it would be awesome to walk across the stage a few pounds lighter. So once they set it up...I was in. Fully in! ﻿﻿I began training using the Couch 2 5k program. I used Robert Ullery's podcasts to motivate me during each run. It was a change of mindset to me that I didn't have to run as hard as I could for as long as I could, but that slow and steady often does win the race. I also had to change my mindset that walking isn't the worst thing in the world. That sometimes you make the mistake of pushing yourself too hard and you are forced to walk...and that's okay! So week after week as the contest went on I watched as person after person dropped out. Like my previous attempts for them..life got in the way. I was determined that I was going to finish this contest strong. I rearranged my life to revolve around my running schedule. That meant missing out on playing intramural sports with my friends and that I often would have to go run after I got off work, but it was worth it. I finished the Couch 2 5k program and ran in the 2008 Race to Wrigley 5k. Despite losing 30 pounds...I didn't win the contest at work. I finished in second, but again, it was worth it. I walked across the graduation stage feeling much more confident about myself because I had finished something I had started. I had got the ball rolling on my desire to lose weight and was determined to keep it rolling. Since then I have finished several other 5k's, a 15k and I recently finished my first half marathon. 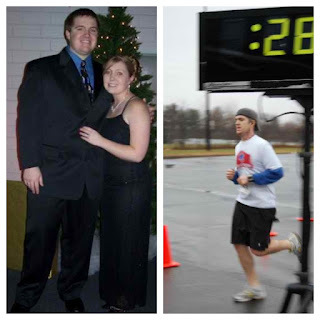 Since beginning my running journey in January of 2008 I have lost a grand total of 75 pounds. I currently weigh somewhere around 175. My weight is no longer the driving force behind my running, but is a reminder to myself that I can finish what I start. That no matter how depressed and conquered you feel...there's hope. That you don't have to live a defeated life and that you're worth more than buttery biscuits and sugar filled drinks. If I can inspire you to start or continue your journey...shoot me an e-mail by clicking HERE! We should scan in the before & after pictures the grad office took. Excellent! It is so awesome that you share your story. It is inspiring . My husband and I have our own weight loss journey and though different I can relate. It is heart warming to me to know that there are people like you who use their own stories to encourage and inspire others. You are an incredible human being and I am proud and privileged to have connected with you via twitter. Always be blessed. I am working on completing a race in every state (KY is on the list still) and I discovered your blog. It's an inspiring story - I love it! I also have a blog: http://irunthesetowns.blogspot.com/ I love finding others who love running and blogging. Congrats on your awesome journey.